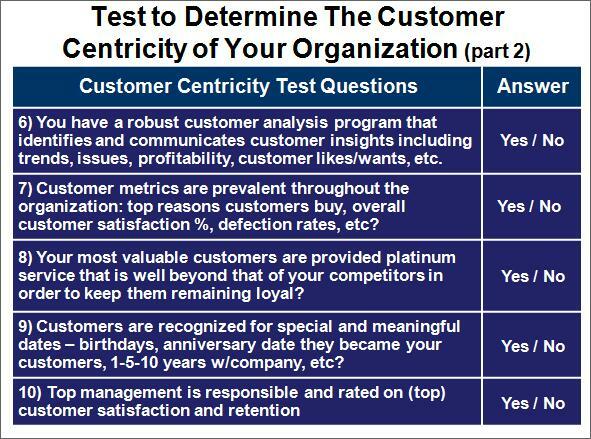 The Customer Centricity Test – How Customer Oriented Is Your Company or Organization? 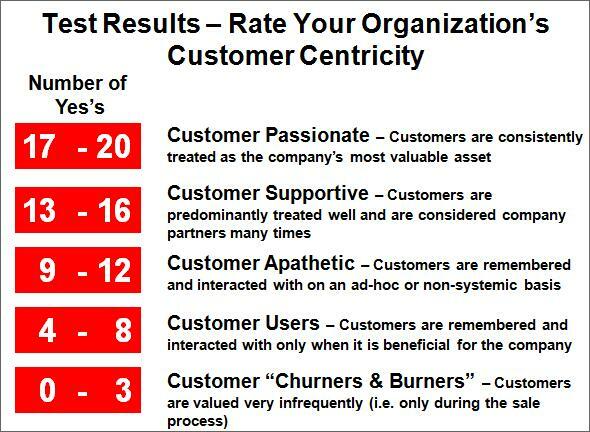 This blog is dedicated to help you determine whether your company or organization has a customer centric culture. 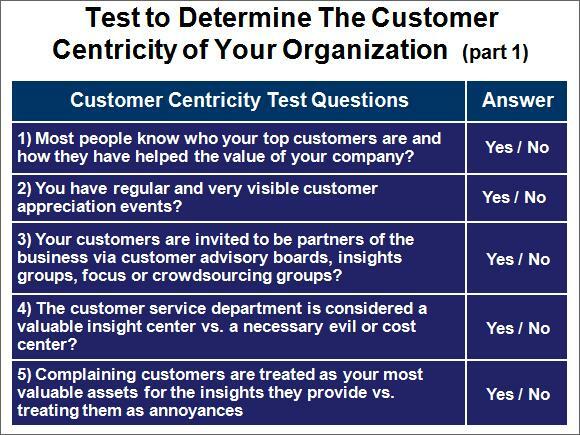 Take the following test to determine how customer centric your organization’s culture is toward your customers. 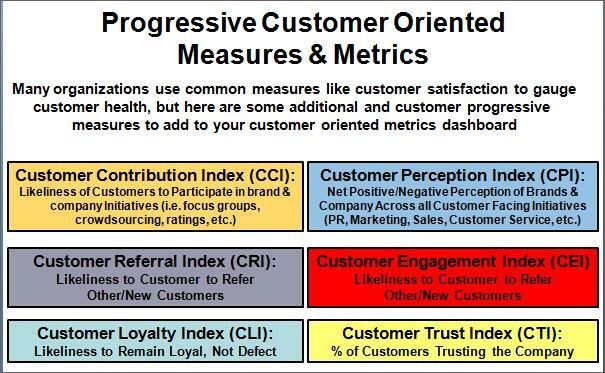 Is your company customer progressive or does it practice customer churn & burn? 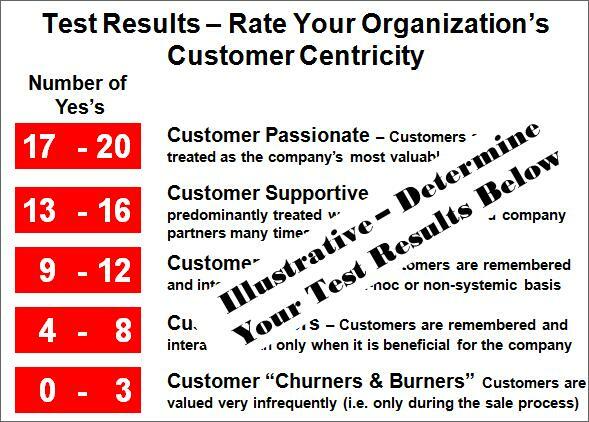 Based on the Test Results above, Is Your Organization Customer Centric and Does Your Company Have A Customer Oriented Culture? 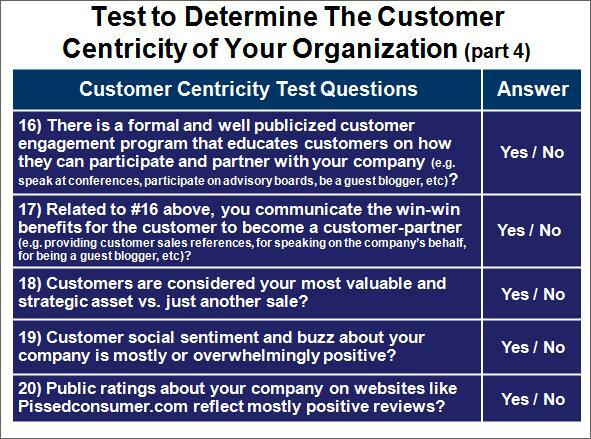 Depending on the number of questions you were able to answer “Yes” to in the exam above determines your overall customer orientation score. Based on the total score (Number of “Yes” answers), you can rank your organization based on the above grid. Steps 1 & 2 are self explanatory. The sample metrics touched upon in step #3 above are detailed more in-depth on the next page. 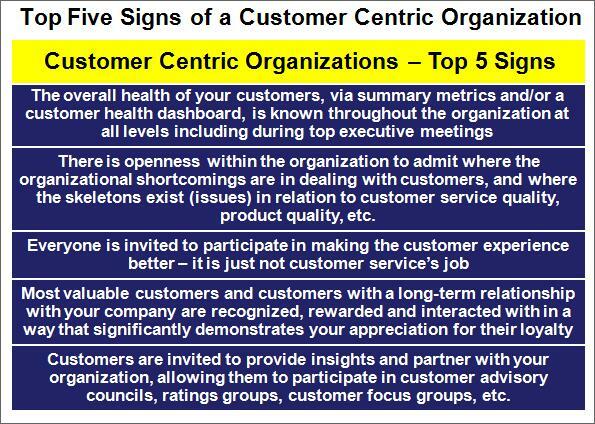 In summary, transitioning to a customer oriented culture requires leveraging a proven customer oriented culture enablement methodology, skilled CRM change management practitioners and a holistic approach to implementing customer oriented methods and practices. I have successfully used this approach on many customer oriented projects at many of the Fortune 500 companies in the US. To find out more about this topic, please contact me via the “About” section of this blog. About Steve Jeffes: Steven Jeffes is a thought leader in developing world-class marketing, digital marketing, e-commerce, corporate innovation, CRM, social media, loyalty, customer loyalty/retention and customer service excellence programs. The recipient of many awards (http://www.stevenjeffes.com/stevenjeffes_awards.html), Steve is expert marketing strategy design & optimization: design, development and launch of world-class and best practice marketing and social media programs; change management organizational design and process excellence in marketing, sales, customer service, engineering, product management; and development of successful sales and sales management programs for Fortune 100 companies and government entities. He holds dual B.B.A. degrees in Computer Science and Finance from Temple University and a Master’s in Organizational Design and Excellence from the University of Pennsylvania/Wharton. Steve can be e-mailed at stevenjeffes@gmail.com or contacted via phone at 518-339-5857. 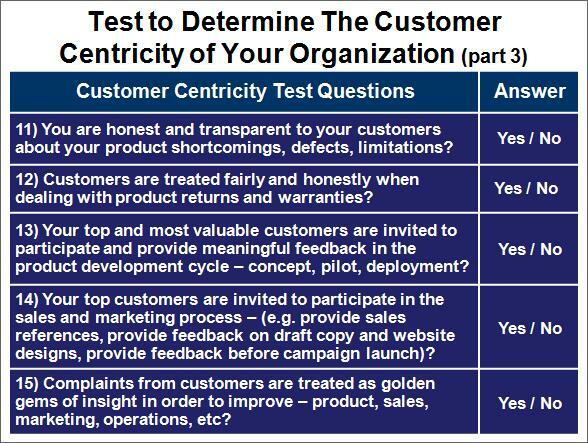 5 Responses to The Customer Centricity Test – How Customer Oriented Is Your Company or Organization?